It is only the combination of German engineering and a certain knack for streamlining group dynamics that makes it possible to fit so many seats in the limited space that is 747 from JFK to Frankfurt. No other circumstance will allow you to reach such level of awareness of the tiniest detail of your bone structure, nor is there a more reliable test of your kneecaps’ resilience than a heavyweight Russian lady trying to recline her seat into your rib cage. Fly with Lufthansa to see the stars, I say. A dapper African gentleman on my right pulls out a laptop, while I try to watch ‘Fading Gigolo’ with Woody Allen and John Turturro. Why am I not like John Turturro? I would love to be John Turturro. He is a man’s man. A stewardess offers drinks. I go for wine, barrels of it if I can, in an effort to make my body as limp as possible. Wine, turn me into liquid rubber (Is there such a thing?). Or numb me into indifference about living without kneecaps. Or make me John Turturo, whichever. Every time she passes by, I ask for a refill. On the third or fourth sortie, she warns me to keep the glass above my lap and not my neighbor’s laptop. “We don’t want any accidents, do we?” she flashes a smile of thousands of trainings. “Oh, I am sorwy,” I slur to my “who-will-conquer-more-armrest-territory” impeccably dressed foe. “I don’t remember the last time I was this close to non-family.” I follow the joke with a hearty laugh, while he worryingly moves the laptop further away from my reach. Not a smile. In retaliation, I use his shuffle to annex good two thirds of the armrest. That should serve you right, humorless fiend! “I know, right? I am sending a vicious email to Lufthansa and Star Alliance as soon as I land.” I picture myself in the Shangri La of business class. Warmth curses through my veins at a thought of extending my legs. “Working while flying?” I summon all powers to sound coherent while giving the aggressor in front of me a subtle but malicious knee-shove. “What do you do, if I may ask?” This Bosnian doesn’t give up that easily, bro. Feel the fuming revenge of South African merlot. “Online outreach and marketing, communications, is my occupation.” he says without lifting his eyes from the computer screen. “Oh, oh!! Really!! Me too, that is sort of what I do as well, I work for this international…” Cabin lights go off. “I am sure you do, sir, almost everyone I know is in communications these days.” he cuts me off. “Hm, yes, I guess.” I accept defeat, and surrender body and mind to the process of fermentation. No hope for instant friendship here. At least the armrest is all mine. My conquest doesn’t last long, as the bladder orders me to go to the loo. “Excuse me, can I?” Very happy to cause him to have to get up, laptop and all, although I hate to concede to Putin’s forces who promptly recline seemingly beyond the mechanically possible. As I do my thing, I get slightly startled by the pale stranger looking at me from the overlit toilet mirror. Man, I look like Nosferatu’s cousin. 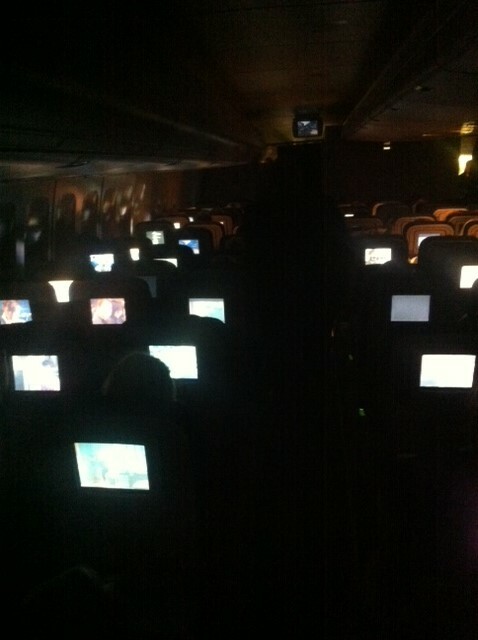 I find the sight of the cabin with all screens aglow strangely moving. Wine does that to me. My Instagram followers would appreciate the metaphor, I ponder, although its exact meaning eludes me. I snap and return to my aisle to soak up the repeated delight of causing His Elegance to stop writing and get up again. For a while longer than necessary I struggle to squeeze into the crevice of space left by the recliner’s onslaught and try to sleep. The neighbour types on through the hum of the flight, my eyelids no match for the glaring light of his screen. I open my eyes, contemplating a shaolin move to turn to the other side, but instead start reading the text he is typing into an e-mail template. The name of the addressee sobers me up in a millisecond, almost causing me to jolt upwards. Surprise at the coincidence engulfs me for a split second, but a series of conclusions follows and it quickly dawns on me what is going on. I feverishly realize that the name of a familiar recipient is secondary to the fact that next to me sits royalty, a samurai, one of the mythical creatures we all know exist but no living person has ever seen in real life. I tremble with trepidation as thousands of fireflies carrying countless questions swarm inside my stomach. Frantically I remove my elbow from the armrest, scrambling to come up with an opener. How do we start anew? What do I do, what do I say?!! With terror I recall how drunkenly pale I look and for a second think of slapping myself a little to get some rouge into my cheeks. I quickly abandon the idea as too risky. He may misunderstand and call security. I could offer him some of the chocolates I bought as a gift for my daughter, I am sure she will understand. But what if doesn’t eat chocolates? He must be on some no-calories superhuman green juice and jasmine pollen diet. And just as desperation starts creeping in, the thunderbolt strikes! I know!! I will invite him to take my seat too for a while, make himself comfortable, rest, use the extra space to have a nap, whatever he wants. I don’t mind loitering by the toilets for an hour or two. Yes, no human would be able to resist such an offer right now. And when I return, I’ll be sober, I’ll smile and innocently pursue a conversation, gently steering it to his work. Brilliant! But, first let me watch him work in silence for a bit, let me drink from that well of pure genius. I pretend to shuffle in my sleep, adjust my head to get the best angle possible, and a wondrous calm envelops me as I observe the master’s process. God bless Lufthansa, I smile inwardly, as magic flows through his bejeweled fingers and materializes in sublime line after line of text on the screen. I am de Pauline, very young girl; I was raised up by a single mother who was a missionary before she died few months ago. 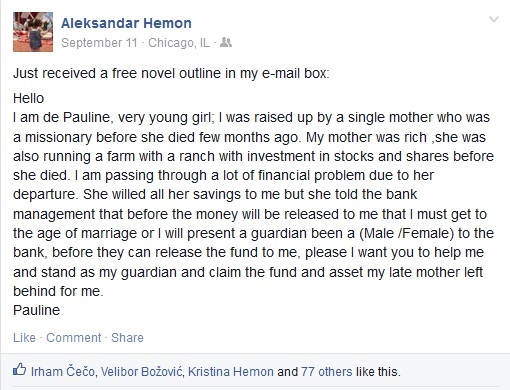 My mother was rich, she was also running a farm with a ranch with investment in stocks and shares before she died. I am passing through a lot of financial problem due to her departure. She willed all her savings to me but she told the bank management that before the money will be released to me that I must get to the age of marriage or I will present a guardian been a (Male /Female) to the bank, before they can release the fund to me, please I want you to help me and stand as my guardian and claim the fund and asset my late mother left behind for me.